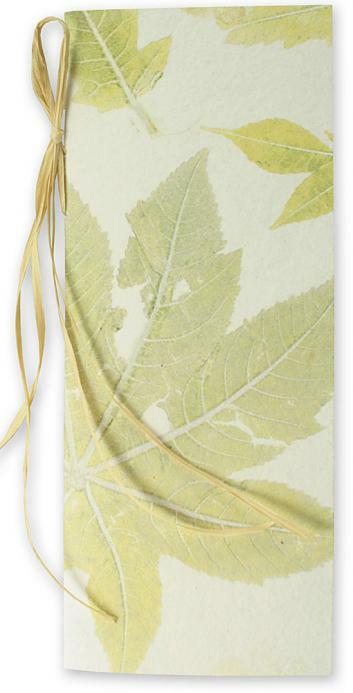 Rustic and Earth-friendly handmade paper Ceremony Program: dyed with imprints from real leaves. Interior sheet is 100% postconsumer recycled paper. EACH PROGRAM WILL HAVE A DIFFERENT LEAF PATTERN. Tall booklet style wedding program made from handmade paper that is dyed with real leaves. Cover made from recycled cotton rag handmade paper from India. This sheet is imprintable - you can print your names and date on the front cover with an oversized printer. Die cut and scored for super easy assembly. PAPER FACTS: COVER sheet made in India and interior sheet is 100% post consumer recycled paper made in the USA or Canada. Program Cover:tree-free imprintable handmade cotton rag paper. Diecut and scored.